[Ken_S] sent in his GardenMon (coral cache) project. It’s a set of light, humidity, moisture and temperature probes that monitor the surface and below ground conditions in his garden. 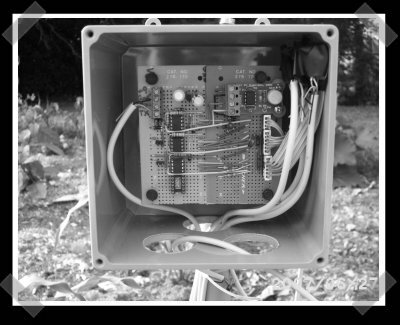 He’s using several picaxe micro controllers to take readings with a variety of off the shelf and commercial sensors. Once he started collecting the data, he added a programmable servo controlled watering valve with a configuration that he tweaks accordingly. The site is on geocities, so use the cache. I had a few requests, and this fits, so I added a home hacks category. This is a cool project, I have been thinking of doing something similar (but not as complex). I was thinking a few well placed moisture sensors could be used to activate some soaker hose solenoids. very handy, perticularly if you live in Australia (water restrictions and everything). If the lawns big enough several of these units and seperate sprinklers could ensure adequate watering where its needed. Wow. Hack-a-Day is reading my mind. I had to water a bunch of plants this morning for some family that’s out of town. I was thinking of a set up very much like this on my drive to work. Although my idea was for wireless communication powered by solar panels ala beambots (not sure if it would realistically provide enough power though, but a guy can dream). This is a really cool project, I work for a non-profit that deals with Peak Oil and energy use, we’ve deployed some weather stations from Davis Instruments to do this kind of stuff, it comes with a wireless console and all sorts of nifty sensors, but the damn things cost $1,000 a pop, this may be a cheap alternative to Davis’s juggernaut. Does anyone feel like getting paid to make a few of these for us? This is a really awesome job. I gonna make one similar soon. My idea is to hack some cheap solar garden lights to house the sensors and transfer the data wirelessly. It would be more convenient to deploy and rearrange the sensors. neither geocities nor the cache work. Could someone post the site somewhere? This looks very cool. I agree; wireless and solar powered would be cooler, but I just knocked it out with the KISS principle. Tim; how many of these would you need? anyone been able to get the code file of the remote programming module? i cant seem to download it..
link was broken, and i wonder… Is it working? >link was broken, and i wonder… Is it working? No, the link is broken. GeoCities has some how declaired me in violation of their Terms of Service. I’ve bounced a few E-Mails back and forth trying to find out exactly what the violation is. PicAxe’s are pretty darn basic, what did you have in mind? You probably got the “slashdot” effect and they pulled your site because it was sucking a lot of bandwidth after hackaday picked you out. I am highly interested in this project. Any chance you’ll get it back online soon? >they pulled your site because it was sucking a lot of bandwidth. Probably, but every time I E-Mail them I just get back the exact same form letter. I don’t think anybody reads the message, they copy & paste the form letter in the reply and go to the next message. >I am highly interested in this project. I am interested in the whole project. More so the probes you used and the methodology in general, as I have experience and development tools for AVR.